What a treat I’ve got for you and your kids this week. After all, who doesn’t love weaving? Especially when it’s as fun, experimental, weird, wacky and wonderful as this! I enjoyed creating this craft so much as I could really let my imagination run wild. It’s loads easier than it looks too. 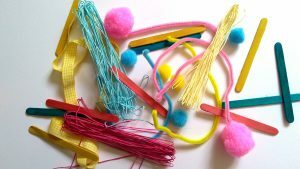 Most of the equipment I used, such as lollipop sticks, pipe cleaners and pom poms are really cheap and easy to find, in fact you probably have them in your kid’s craft stash at home already. You might not have used them like this before though! 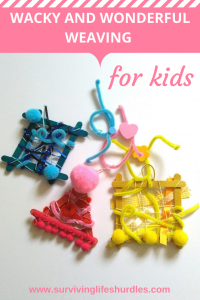 Weaving is a fantastic activity to try with your kids. They will learn so many important skills whilst having plenty of fun at the same time. Weaving will help your child to develop their fine motor skills and encourage them to think creatively. They will learn so many art skills that their art teachers will be thanking you for years! Your child will be exploring and making decisions regarding shape, composition, colour and texture whilst tapping into their imagination too. This craft (being wacky and wonderful) doesn’t explore weaving in the traditional sense as there aren’t many ‘rules’ that need to be followed here. 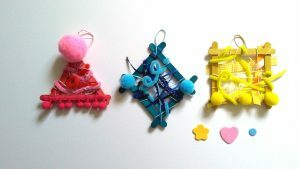 It’s not about weaving for function, (a technique which is really useful for kids to understand too) it’s more about artistic expression. There are loads of different ways of personalising the woven experiments and being really imaginative with their design. I’ve provided a few alternative ideas and suggestions to get you started in the ‘make it your own’ section at the end of this article too. 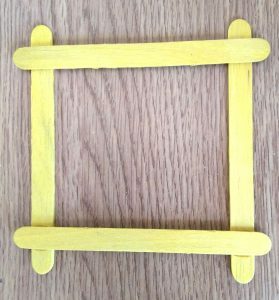 Take the lollipop sticks and create a basic shape for your frame (you may wish to paint your lollipop sticks first). Make sure that the ends of your lollipop stick overlap so you can stick them together with a blob of PVA glue. 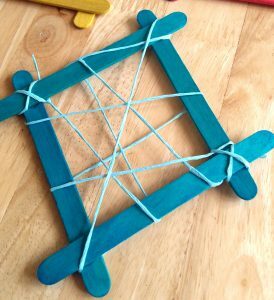 Once the glue on your frame has dried, use some thin yarn/raffia to wrap around your frame, tie one end onto your frame, keep it taut and wrap it around your frame in random and unusual directions for an interesting effect. Make sure you have enough yarn/raffia left at the end to tie it off. Wrap around and weave through any other ribbon/string/yarn/raffia etc in whichever directions or styles you like. 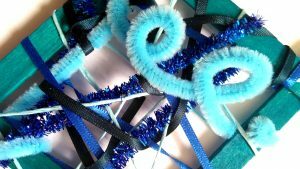 Take your pipe cleaners and weave them into your design. Pipe cleaners hold their shape well so you can bend them to create some interesting effects like the loops I added to my woven experiments. 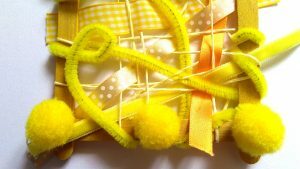 Glue some pom poms onto your weaving to add an extra fun finishing touch! If you wish to hang your woven design, tie a loop of yarn around the frame at the top of your design for a wacky and wonderful hanging decoration! You can see from my woven experiments that I stuck with one colour choice for each of my designs but there’s no reason why you can’t explore a range of different colour options and even bring in a little colour theory education for your kids! So, for example, you could combine colours which are harmonious/next to each other on the colour wheel (e.g. blues, greens and purples or reds, oranges and yellows) or explore contrasting colours/colours which are opposite each other on the colour wheel (e.g. blue and orange, yellow and purple, red/pink and green). You could use all the primary colours (red, yellow, blue) or all the secondary colours (orange, purple, green) together. Or just use pale, natural, bright or dark colours. You could even exclude colour altogether and just go for black and white. I love finding ways to explore colour with kids, especially bright colours! I love these suggestions by Laura from Wafflemama for some rainbow coloured themed crafts if you’d like to explore colour even further! Why not turn this craft into a nature activity and swap the lollipop sticks for twigs and weave some natural elements into your design, such as leaves and petals too. 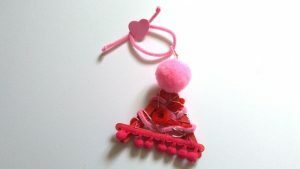 There is so much fun you could have by using different materials, embellishments and textures too. Why not weave with strips of coloured paper or twisted newspaper? Or how about plaiting your materials before weaving them into your design. You could even add tassels, foam shapes or beads/buttons to your woven experiment too. These are just a few suggestions but there are plenty more ideas you could try too! I hope you and your kids really enjoy the process and squeeze as much creativity out of this craft as possible! If you’re after a few more craft ideas to try with your kids over the summer holidays here are a few more simple and fun tutorials for them to have a go at; decorative paper butterflies for easy fun with paint, PVA glue trapping for more wacky experimentation and a fun and fancy rosette for a lovely way to reward their artistic efforts! 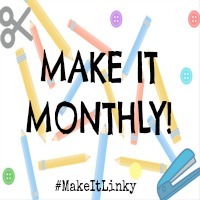 If you and your kids do have a go at any of these crafts during the holidays I’d love to see them, so please don’t hesitate to get in touch with how you got on! This sure looks fun! 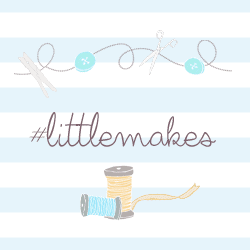 I’m looking for new crafts ideas to do with my little girl and I can’t wait to try weaving with her. I’m pretty sure she’ll enjoy this.